Mind the Bridge: Start up in the spotlight: Tripshake. 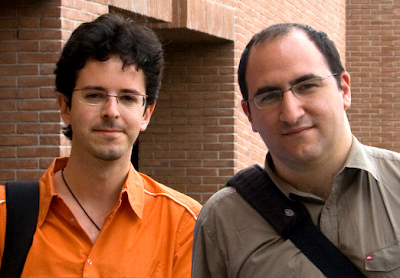 Let's meet another Mind the Bridge semi-finalist 2009: Tripshake's Antonio Bonanno (on the right in the picture, with partner Giorgio Montorsino). Antonio, can you tell us briefly what is your company about? TripShake is a social marketplace for travel. We make it easy for travelers to find personalized offers provided by travel professionals all over the world. At its core, is a question&answer service where users can obtain answers to their specific questions from expert and trustable sources, as well as from the experiences of other travelers. Through my network: I met a colleague of one of the organizers at a networking event in Milano. The on-line travel market is big in Europe, but it's even bigger in the US: a gateway (or a bridge!) in that direction could be a great opportunity for us. Meet with strategic partners: someone who could help us developing our business overseas, or with whom we could start working with to lay the foundations for our future landing in the US. And meeting with investors: TripShake could be presented as an investment opportunities to business angels and second-tier VC in the US. The size of the investment we're looking for weighs about 400.000 €. From what I could see during this year as a startupper, I believe neither the investors nor the enterpreneurs are ready to think on the scale needed to really make the jump and build a relevent start-up scene. Too little money and ideas who are not ready to be invested in are the weak points of a growing start-up scene. I'm sure we'll get there at some point, but I fear it might be too late - other countries, like Spain or Eastern Europe, are moving faster than us! Thank you Antonio, all the best for your project!